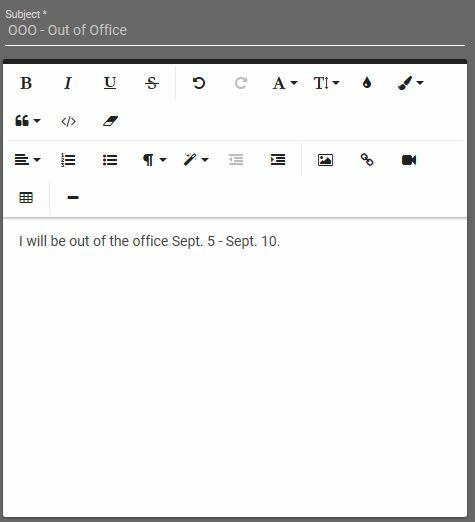 Are you going on vacation soon and need to setup an Out of Office reply? Setting up an autoresponder for your Smartermail email account is a simple way to ensure that anyone emailing you is notified of your absence or inability to respond immediately. Please note that to avoid autoresponder loops, (by default) your email is configured to limit responses to one per day for a given sender. You can follow these simple steps to setup your own autoresponder. Log in to your webmail account then locate and click ‘Settings’ from the top navigation bar (the “gear” icon). Then under Settings, click the Autoresponder link. On the Autoresponder screen you will find a message box and an options box. You will want to fill in your Subject and Message body. On the Options box you have several options. When you are ready to enable the autoresponder you can select the toggle to turn this functionality on. By default the toggle to ‘Disable responses to indirect mail’ is on (this option tells the autoresponder to only send your message to email sent directly to you and to not respond to any mailing list, forwarded or alias addressed email). In instances where you do not want to set an active date range for your autoresponse message simply leave the option ‘Only send between certain dates’ toggled off. If you choose to set a range of dates toggle ‘Only send between certain dates’ on, then set your start and end dates and times. Once you are happy with your settings and message click ‘Save’ at the top of the screen and test your autoresponder by sending an email to yourself from another email address. It really is that simple to set up an autoresponder in Smartermail!